John LaGrone came out of Southern Methodist Univsity where he was an All-American. LaGrone was an outstanding defensive tackle for the Edmonton Eskimos for eight years from 1967 to 1964. In thos eight seasons, Lagrone won six West All-Stars (1967, 1968, 1969, 1971, 1972 and 1973) and two CFL All-Stars (1968 and 1969). Unfortunately, there are no defensive tackle or quarterback sacks stats kept for those years, but LaGrone's All-Star selection speak volumes. LaGrone was named the Outstanding Lineman in the CFL in 1969. LaGrone was a big part of the Eskimo turn around in the early 1970, and whle he and Edmont got to two Grey Cups in 1973 and 1974, both were losses, to Ottawa in 1973 and Montreal in 1974. 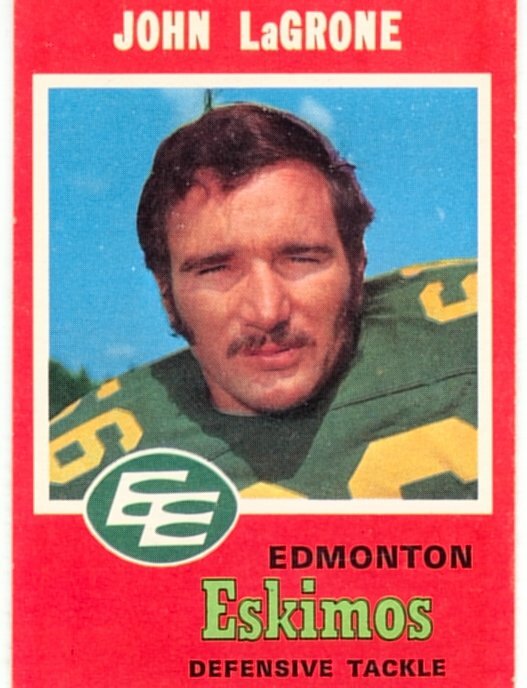 Edmonton went on to win the Grey Cup in the year after Lagrone retired in 1975.